A symbol of strength, oaks are easily recognized by their distinctive fruit, the acorn. Slow growing, they produce durable wood. Dimensions: 10.5" x 5" This unique knocker is crafted in brass, will show your guests your love for the beauty of nature. 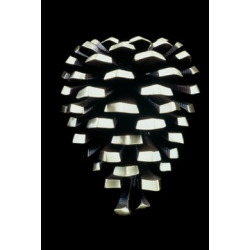 As the pine tree is the symbol of immortality, the cones are regarded as symbols of fertility. This door knocker is sand-cast in red brass. Dimensions: 6" x 4.75" This unique knocker is crafted in brass, will show your guests your love for the beauty of nature. Most noted as the Scottish symbol, it is found in fields, pastures and roadsides. It is rich in nectar for bees and butterflies. This door knocker is sand-cast in yellow or red brass. Dimensions: 6.5" x 4.5" This unique knocker is crafted in brass, will show your guests your love for the beauty of nature. Beautiful hand forged iron door knocker reminiscent of early american design yet classic enough to be compatable with modern tastes. Classic iron door knocker. Beautiful hand forged iron door knocker reminiscent of early American design yet classic enough to be compatable with modern tastes. 6 1/4" Center to Center with a 1" variable - Attaches with wood screws/surface mount. Traditional hand forged S Curl door knocker. 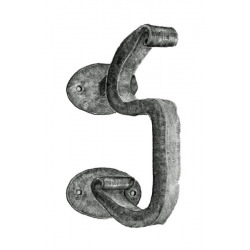 Beautiful hand forged iron door knocker reminiscent of early American design yet classic enough to be compatable with modern tastes. 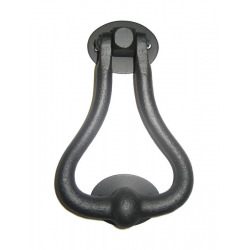 Black Iron Door Knocker - Classic Design Beautiful hand forged iron door knocker reminiscent of early American design yet classic enough to be compatable with modern tastes. 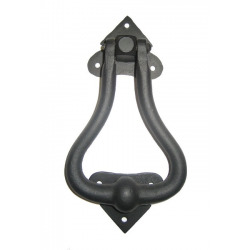 Forged Door Knocker - Elegant Design! Beautiful hand forged iron door knocker reminiscent of early american design yet classic enough to be compatable with modern tastes. 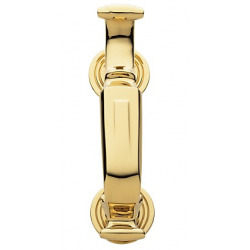 Lifetime Polished Brass "S" Door Knocker This brass decorative front door knocker will add the finishing touch to the entrance of your home. Welcome you guests with this artistically crafted spoon door knocker. 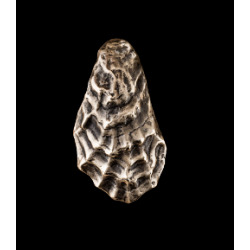 Sand-cast in bronze this knocker measures 8.5" x 2"
This exquisite oyster shell door knocker is so well crafted that one expects to discover a precious pearl. Crafted from sand cast bronze, this knocker measures 6.5" x 3.5". 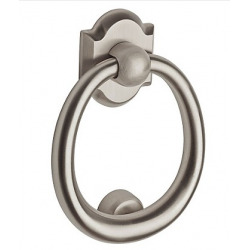 This solid brass door knocker is available in four finishes. The narrow style measures 2 3/4" at its widest point and measures 7 1/2" in length with a one inch projection. Great for a small space and the style will enhance a variety of architectural elements. 5.75" ctc between bolts. Satin Black Colonial Door Knocker This black decorative front door knocker will add the finishing touch to the entrance of your home. 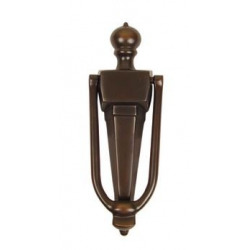 Oil-Rubbed Bronze Imperial Door Knocker This Oil Rubbed Bronze decorative front door knocker will add the finishing touch to the entrance of your home.